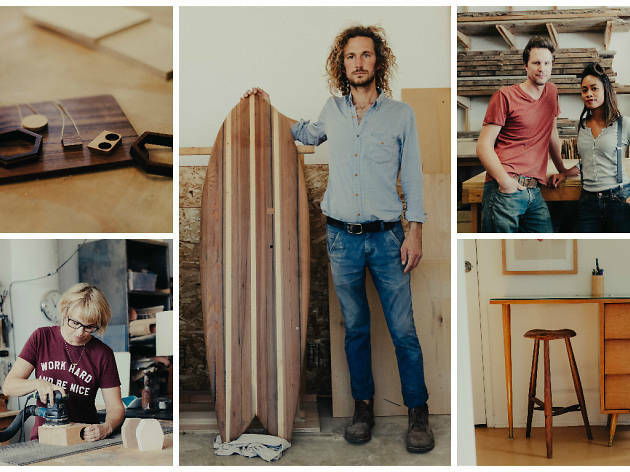 We sat down to talk shop with six of the city's best local woodworkers to find out what inspires their (handmade, swoon-worthy) craft. Mitchell was introduced to woodworking as a teenager during summer construction jobs. "I thought the cabinetmakers and finish carpenters were the coolest dudes in the world," he says. "They had beautiful vintage trucks, made lovely work and a few of them surfed and even shaped their own boards." Mitchell began apprenticing under a finish carpenter, working through college making cabinets, then landed a job restoring historic homes, which is when he decided to build his own furniture under the name West of Noble. 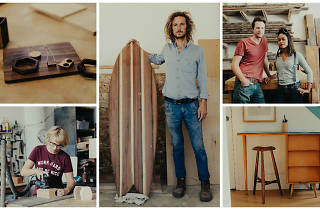 Currently, he shapes surfboards in his Downtown shop between taking on the challenge of making a large table or a credenza that looks light and airy. "That, to me, is the heart of modern design." In school, Denvir learned welding, casting and sculpture—but it wasn't until she found a mentor in wood sculptor Foon Sham that she knew she'd be a woodworker. "I'd always been creative but lacked passion for any particular medium," says Denvir. "You can only go so far with an art form if you lack passion. I found it immediately with woodworking." Denvir creates carved wood pieces ranging from seven-foot sculptures to wearable baubles for a ring finger. She's also worked as an interior designer. "No matter what I'm doing in design, whether on a computer or in the shop, my woodworking abilities always inform me." Aaron and Claire were first introduced to furniture construction while flipping midcentury estate finds for fun a few years back, which eventually led to the Van Hollands designing pieces of their own under the brand M.F.E.O. "I've always appreciated the duality of furniture—aesthetic objects that serve a utilitarian purpose," says Aaron. Until recently, the Van Hollands were working primarily with reclaimed wood from Aaron's grandfather's century-old barn. "The process of using material that was once a living organism is fascinating," Aaron says. "Each piece of wood we work with is a unique experience." Boyce, like many living in L.A., did the acting and voice-over thing for years before returning to woodwork—she'd developed the passion from her father, who ran a wood shop out of their basement. "I found myself just wanting to design and build," she says. Now Boyce spends her time problem-solving; working out a plan of action for each piece–be it a large dining table or tiny planter—and executing it well. "The feeling of accomplishment after I've worked out a solution to a problem and have a tangible object to show for it is very rewarding." Wargo grew up doing carpentry and set design with his father, and drawing with his art-teacher mother. "They put a lot of love into anything they worked on," he says. Though Wargo went to school for cabinetmaking and fine woodworking, he ended up becoming a musician, touring in his twenties and thirties with his own bands, Crystal Skulls and Poor Moon, and as a bassist for Fleet Foxes. He always knew he'd get back to woodworking at some point and recently began crafting three-legged stools. "You have to look at each piece of wood like it had a life of its own, studying the grain structure and allowing that to influence how the piece should be shaped," he says. "You're always learning something new."